Its name comes from the Greek Word "amethystos" (not drunk). The reason is that due to its color of wine mixed with water, it was meant to protect people from drunkenness. The amethyst stone is a variety of macro-crystalline quartz. 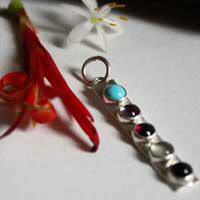 Its purple color can be stronger or lighter depending on the quantity of iron it owns. It is very resistant to acids. But if you heat it more than 300 degrees, its color can change and you can get brown, orange or green colors. 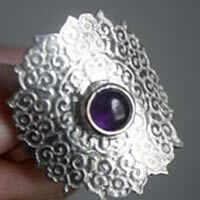 The amethyst stone has been used a lot by silversmiths in several civilizations. Its value was almost equivalent to the one of diamonds until a big quantity of stones was discovered in South America and was exported in bulk. Its price then dropped down. In Egypt, it was used to carve seals. Soldiers would use it during the battle so that they would not fear. There are several legends about the origin of the amethyst that might come from the Romans or from the Greeks. But in both cases, the origin of its color always comes from wine. According to the Greek legend, Dionysos, the god of wine, was after a young woman called Amethystos. But she wanted to remain virgin. The goddess Artemis transformed her in a white stone to protect her. Dionysos became sad and felt humiliated. He then dropped wine on the stone and changed this white crystal into a purple one. Another legend tells that Dionsysos would have been angry at the humans for the repeated insults they had towards him. To revenge himself on them, he decided to send tigers on the first human that he would meet. The victim was a young and beautiful woman called Amethystos. Because of this threat, she asked Artemis to transform her in a white crystal. Dionysos regretted what he had done and poured wine on the stone as a sacrifice and dyed the stone in purple. 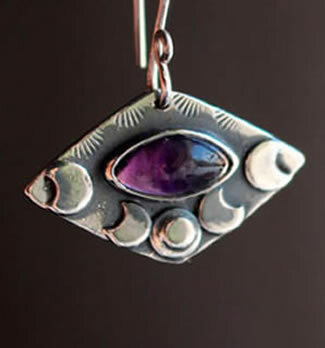 The amethyst is dedicated to Artemis, the Greek goddess of hunting. 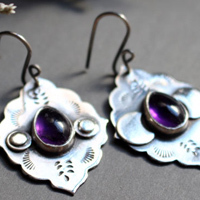 Greeks and Romans used to drink wine in glasses that were bezel set with an amethyst. They thought they would cope better with alcohol during parties with this stone. For Romans, the amethyst stone was dedicated to Diana, the goddess of the moon and the protector of animals. For Hebrews, the amethyst was the ninth stone on the pectoral of the great priest, representing the tribe of Ahlamah. It was also one of the stones of the doors of the New Jerusalem. During the Middle-Ages, the church took the amethyst as the symbol of renunciation to materialism, of obedience to God and of chastity. This is the reason why it is common to see cardinals and bishops wearing this stone as a ring. It was associated to the blood of Christ and to his sacrifice for men. People used to think that the amethyst was a good protection against treason and that it would protect its wearer from black magic and spells. 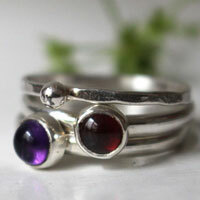 The amethyst is a stone that would reduce and would relieve when experiencing stress. It would balance and protect memories. It would avoid negative energies from the outside and would create harmony. It can transform a bad atmosphere to a good one. The amethyst has a relaxing vibe reducing the muscular contractures and hypertension. It would balance the body for a good sleep. The amethyst would help with heart problems, would cure asthma, diabetes and arthritis. It would stimulate to avoid depressive state of minds and would help women with sterility problems. It would reduce hyperactivity for children and animals. The amethyst would stimulate the production of hormones and of endocrine glands.